Fierce solar blasts that could have badly damaged electrical grids and disabled satellites in space narrowly missed Earth in 2012, U.S. researchers said on Wednesday. "Had it hit Earth, it probably would have been like the big one in 1859, but the effect today, with our modern technologies, would have been tremendous," Luhmann said in a statement. Massive bursts of solar wind and magnetic fields, shot into space on July 23, 2012, would have been aimed directly at Earth if they had happened nine days earlier, Luhmann said. The bursts from the sun, called coronal mass ejections, carried southward magnetic fields and would have clashed with Earth's northward field, causing a shift in electrical currents that could have caused electrical transformers to burst into flames, Luhmann said. The fields also would have interfered with global positioning system satellites. The event, detected by NASA's STEREO A spacecraft, is the focus of a paper that was released in the journal Nature Communications on Tuesday by Luhmann, China's State Key Laboratory of Space Weather professor Ying Liu and their colleagues. 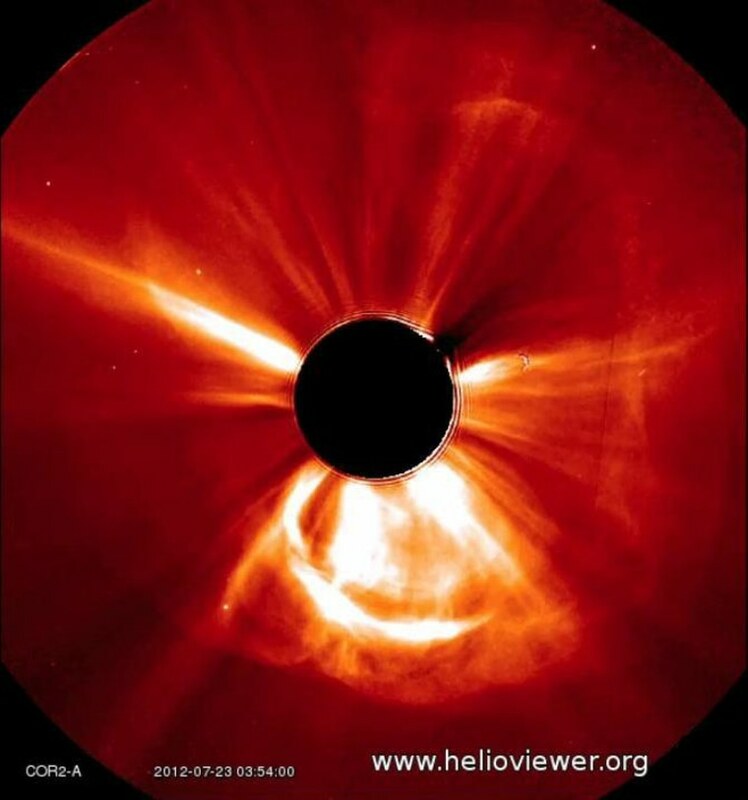 Although coronal mass injections can happen several times a day during the sun's most active 11-year cycle, the blasts are usually small or weak compared to the 2012 and 1859 events, she said.